"It was a no brainer," said a private equity firm general counsel, a former DEA agent, about his decision to hire Cooley for the first major listing of a legal cannabis company on a U.S. stock exchange. Brendan Kennedy, third from right in front, CEO and founder of Canadian marijuana grower Tilray Inc., leads cheers as confetti falls to celebrate his company’s initial public offering on the Nasdaq in New York on July 19, 2018. 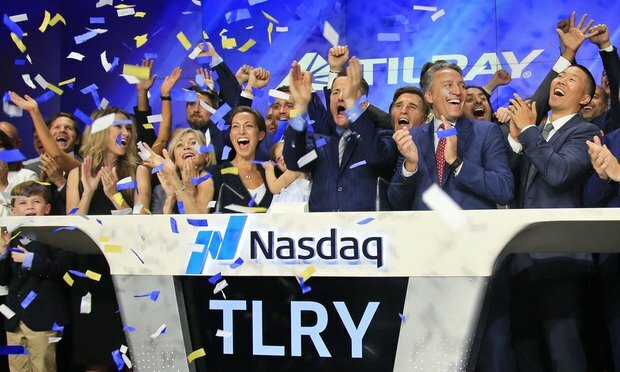 There was some understatement in Tilray Inc.’s prospectus for its initial public offering earlier this month, after which the Nanaimo, British Columbia-based medical cannabis company’s stock market valuation topped $1 billion.